Many of our cat-owning clients will already know how much we hate the name ‘cat flu’. The name comes from a time when we didn’t fully understand what these viruses were. 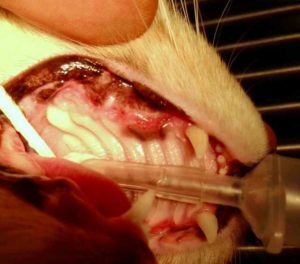 These are serious diseases with often lifelong consequences for the infected cat. Here are the stories of three such cats: Felix, Sooty and Princess. Felix is a kitten from the Animal Welfare League, which means he has had a better than average start to life. He was sold having had a vet checkup, his desexing operation, a microchip, worming, flea control and the first F3 vaccination. It wasn’t long before his new owners noticed something was wrong. He wasn’t playing or moving like when he first came home, and he started eating less and losing weight. His owner, who was a doctor commented that he looked like he had reactive arthritis. He was quite right. When we examined Felix, he had a fever, signs of malnutrition from a poor appetite, and multiple swollen and painful joints. He could barely walk and only did so in a grossly stilted gait as if every joint in his body were painful, which they probably were. He also had that classic sign of a sick cat; the ‘staring’ coat, which is what we call a clumped, dull and ungroomed coat. This pattern of signs and symptoms is characteristic of Limping Kitten Syndrome, which is arthritis caused by Feline Calicivirus, one of the ‘cat flu’ viruses. The video shows him well on the road to recovery, looking well and almost walking normally. He will stay on anti-inflammatory treatment until he no longer has joint pain, and apart from being a calicivirus carrier (see below), should live a normal life. Sooty and Princess are the sole survivors of a very unlucky start to life. They were born to a mother infected with feline herpesvirus, the other cat flu virus. Although the mother did not appear to be sick, she passed the infection on to all her kittens. When this happens, the virus as it spreads causes a range of disease depending on the age of the foetus or kitten. The older foetuses can probably survive the infection but are often born with significant damage, whereas the younger foetuses die and are either aborted or stillborn. Sooty was born with or developed herpesviral neurological disease (we don’t know which as the kittens weren’t seen for the first few weeks). This led to damage to the developing nervous system, giving him the appearance of a human with cerebral palsy. However, he is also generally in poor health and struggles to maintain a healthy weight. At two years of age, even with good care his long-term outlook is guarded at best and his mobility is very poor. Note his size compared with Princess below. Update 2018: Sooty died suddenly around a year after this blog was written. Princess was luckier. She was probably infected later than Sooty. Therefore she was able to fight the infection better and is generally healthy. Her problem has been one that happens to many cats who recover from cat flu. They become carriers of the virus, and for reasons we don’t fully understand, it causes severe and persistent oral inflammation and ulceration. 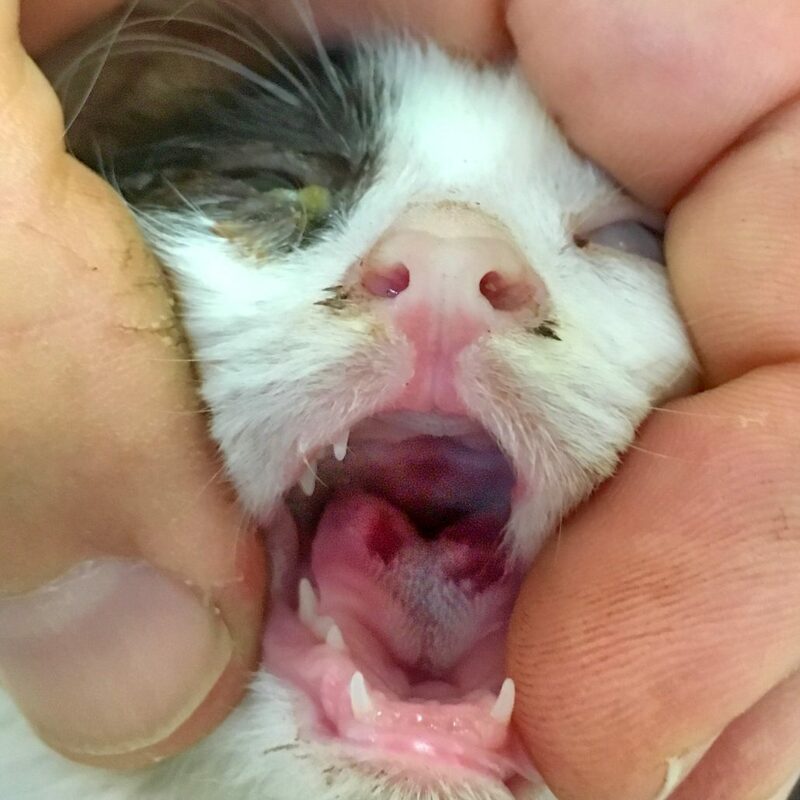 These cats suffer from painful gingivitis and stomatitis (mouth inflammation), progressing to periodontitis. In Princess’ case, she was in severe pain from infection and loose teeth. In these situations, it is often necessary to remove all the teeth behind the canines. As shocking as this may seem, it usually results in a cure to the mouth problems and pain. We are always asked, “How will they eat with no teeth?”. The simple answer is that their mouth is so painful from the infection that they always eat a lot better afterwards. Most cat food really doesn’t require teeth anyway! We are happy to report that since Princess’ teeth have been removed, the gums have healed and she no longer has mouth ulcers or pain. That’s her mouth above. Click here for other causes of mouth ulcers. What Is Cat Flu Anyway? These manifestation of calicivirus and herpesvirus infection are unusual. Follow this link to read about the common symptoms of cat flu. It’s important to remember that in protecting your cat, these viruses are highly contagious. Many stray cats are shedding the virus, and any shared objects such as rubbing posts or water bowls as well as hands and clothing can spread the disease. Vaccination is the safest form of prevention, and over time it has dramatically reduced the number of sick cats we see with these diseases. Read how we prevent these diseases at Cat Vaccination Explained. Hi Hope. It’s certainly possible that the virus has come from the vaccine. It’s very uncommon though for a vaccine strain to then spread to another cat. If you have acquired the kitten within the past seven days it’s probably more likely that the virus is of wild origin and was being incubated. Of course we’ll never know for sure. Crossing fingers!